Multi award-winning ETA Tim E Hendry. Photo by Eva Brand. The following day, I received the most insightful answers from Tim. What comes shining through is Tim’s dedication to his career, his love of family and friends, his appreciation for all the good things that life has given him, and his sense of humour. Tim E Hendry is an internationally known ETA with a long list of awards, but he has maintained his down-to-earth Canadian spirit that was nurtured right here in Ontario. It was a pleasure preparing Tim’s interview and getting to know the man in the jumpsuit with the powerful voice and stage presence. On behalf of all your fans: Thank you, Tim E Hendry! Sandra Gold and ETA Tim E Hendry. I met Tim E in 2003 in Collingwood, and since then we have done so many shows together. I love working with Tim. We have gone on trips together, and have had so much fun. He is by far my best guy friend. He is like a brother to me. Tim was an usher at my 25th anniversary when my husband and I remarried to celebrate our silver anniversary. Tim and I have so many laughs together. I am so proud of him and how far he has come since I first met him. I truly love him like family. Q. How old where you when you moved from Sault Ste Marie to London, Ontario? A. I was 22 years old. Q. What special memories does each city have for you? A. I love both cities. I grew up in the Soo, and I still have many friends and relatives there. I played a lot of hockey growing up there. I got to see Wayne Gretzky play his only year in junior hockey there!! London has been great for my career as a musician, and I have met, and still have so many great friends in London. It is a beautiful city to live in. Q. How would you describe your childhood? A. My childhood was very happy and lots of fun. Q. What were you like as an elementary student and as a high school student? What were your favourite subjects? A. I was a good student...I think. Lol. I was very social. I liked English and math, but also gym. Q. What courses did you take at college? What career path had you chosen at that time? A. I didn’t really attend college. I was only interested in in music; but later I took a year-long computer course at CDI College and got my MSCE in computers, which means I can set up networks, and repair and build computers etc. Q. What other interests did you have while at school? A. My other interests were always sports and music. Q. At what age did you realize you had a talent for music? A. I was probably around 17 or 18 years old. Q. What music did you listen to at home? A. All kinds...but not any of that electronic dance crap...mostly classic rock country and Elvis. Q. Did you take any formal music lessons as a child? A. No, I didn’t take any music lessons. Q. Did you participate in any concerts or plays while in school? A. Yes, there a few here and there that I can remember…Lol. Q. Did you play any organized sports in your youth? A. Yes, I played tons of hockey and football. Q. Tell us about your experiences as a drummer in the band Mankind. A. It was an amazing experience. Writing and recording your own music is very rewarding, and also hard work; but I am very proud of the work we all did in that band...an incredible group of writers and musicians. I still listen to the stuff we recorded. Q. Did you do vocals with Mankind? A. I didn’t do any vocals except for some backup in the studio. I mainly just played drums. Q. Did you have an association with any other bands prior to becoming an ETA? The Rumblebees with Tim on drums. A. I play drums in many other cover bands here and there. I always have, always will. Q. At what point in your music career did you decide to do a tribute to Elvis? A. I went to the Collingwood Elvis Festival about 16 years ago to see what it was all about. 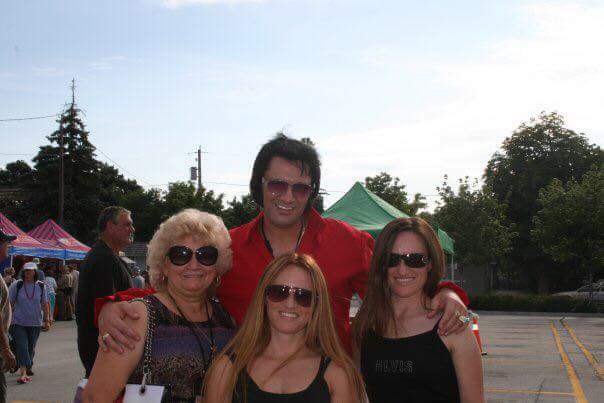 Once I saw how professional and serious it was at paying a proper tribute to Elvis, I jumped at the chance to try and do it. Q. What personality traits best prepared you for a career in the limelight? Q. How were your performances as Elvis received in your hometown? Were people surprised that you went from being a long haired, heavy metal drummer to a short haired, sideburn wearing performer? A. They were GREAT!! And yes, people were surprised to see the change in me; but they love it as far as I can tell…lol. I have been asked several times to come back to the Soo; and the London shows are always sold out!!! Q. What would you like to tell us about your backup band, The Yes Men? A. The Yes Men, to me, are the very best Elvis tribute band. Several other ETAs who have seen them, and performed with them, would agree with me. We are like a family, and they are all my very good friends. 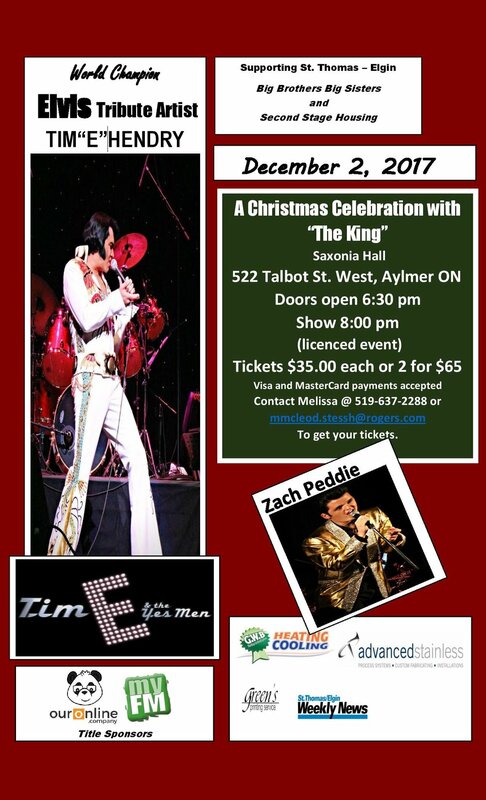 They are huge Elvis fans, and fans of the TCB band, so they are very meticulous when it comes to replicating Elvis music. Q. 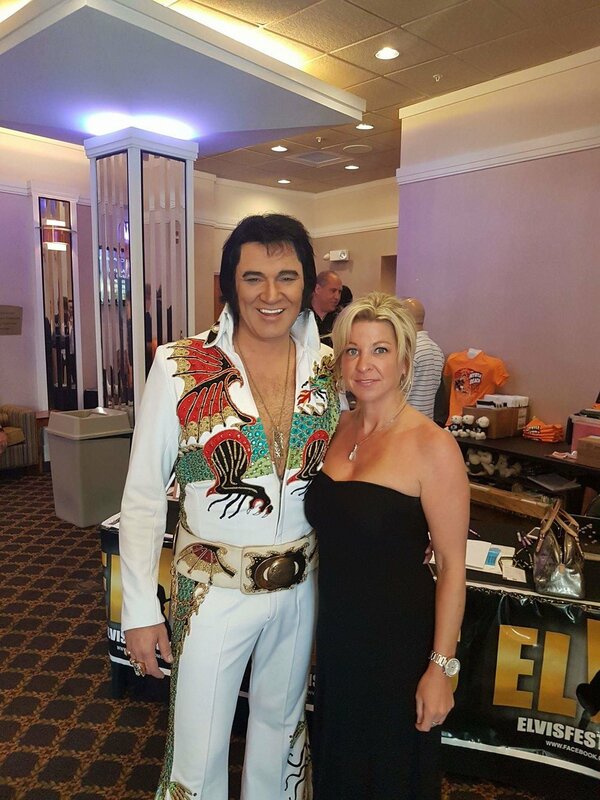 What feelings did your parents express after seeing you perform as Elvis? A. They were overwhelmed, proud, and so happy to see me do the tribute. I did start it because I loved Elvis, but I also knew how much my dad loved him. Q. What life lessons did you learn from your dad? A. Way too many to list, but some are: Always be nice--no matter what. Protect your loved ones always, but be nice. And don’t burn bridges unless they need to be burned for your own good and those whom you love. Also, always cheer for the Dallas Cowboys and the LEAFS!!!! Q. What would you like to tell us about the Diamond Jim Hendry Memorial? A. I’m working on another show for the Memorial again in the Soo...details coming soon. My dad was a very well-liked and popular guy in the Soo, and I wanted to do something for him to commemorate what he meant to so many. I also help the Canadian Cancer Society. We donate some of the proceeds to cancer support, but not research. I don’t believe in the research part, as there is, and always has been, a cure for it. But that’s another subject that I am very passionate about...no one should die of cancer!!! Q. What items that were your dad’s do you cherish most? A. All of his Elvis stuff, and stuff he had in our rec room and bar and in the basement of the house where we grew up in the Soo. Tim with his friend Barb Mason (on his left), who is also president of the Tim E Hendry Fan Club. Q. Who are the important women in your life? How does each woman you mentioned bring meaning to your life? Q. In what ways are you different on stage and off stage? A. I am very different on stage and off. Off stage I’m just plain old funny guy Tim who loves the Leafs, his family AND friends. On stage, I try to be professional and pay the best tribute to the Greatest I can; but I also joke around and have fun on stage too—just like Elvis did. Q. What led to you and The Yes Men performing at Lorne Avenue School in 2004? A. A friend who taught there asked us to do it. It was fun, and the kids loved it! Q. Have any former students from Lorne Avenue School come up to you after a concert and tell you they remember the day you entertained them at their school? Q. What strategy is necessary to ensure that the next generation will keep Elvis’s memory alive? A. Just be sincere and humble in your tribute. Always respect Elvis, his fans, and his music; and keep doing it as often as you can. Elvis music will always transcend through time, so just keep singing and playing his music...all people love it no matter what they say...it’s ELVIS....HELLO!! Q. Describe what you were feeling before, during, and after your first win? A. Well my first win was back in 2007, I believe, and there were a few more before 2010; but 2010 is when I just moved back from Florida and got serious about being a full time ETA and hit the pro contest circuit. The first win was like all of them...amazing! It was such a great feeling that I seemed to be doing the right things. I also felt very lucky and truly blessed to be able to do this. But I never rest on my laurels...I feel I can be better and always strive to improve. Q. What competitions are more likely to further the career of an ETA? A. All of them I think. The more exposure, the better; and the more you do, and the more you sing, the better you will get. Obviously the world championships will help a career, especially the ultimate contest in Memphis. Q. Is there a title that is still on your wish list? A. The Ultimate would be nice, but if doesn’t happen its ok. I’ll keep paying my tribute to Elvis no matter what. Q. What qualities do you bring to your performances during competition that has led to you winning so many titles? A. Just trying to emulate Elvis to the best of my abilities. I still watch his videos and listen to him every day, and just practise, practise, practise. Contests are when you have to be as close as you can to Elvis to win. You have to stay in Elvis character and try to sing the songs like he did...very, very hard to do. Q. Have you won titles that were first wins for a Canadian ETA? A. I think I have...many of them; but that doesn’t matter. Canadian, American, European, etc…so many great ETAs...I’m just lucky to be a part of it. Q. Of the many titles you have won, which ones are the most meaningful to you? Why? A. I have won 35 titles, and they all mean the world to me. The 2013 King of the World Championship was special; but they all are...I mean that. ETA Tim E Hendry. Photo by Eva Brand. Q. What is the atmosphere like backstage prior to a competition? A. A lot of nervousness, but everyone is focused. All the guys help each other. It’s truly a special group to be a part of. Q. How confident were you after winning the Georgia Elvis Festival in the spring of 2017 that you had a chance at the Ultimate Elvis Festival in August, 2017? A. I was confident, and always have been; but I also know it’s tough to win any contest. So I just do what I do to the best of my abilities and give 100% always. Q. When competitions don’t go as you may have wished, how do you gear up for the next one? A. I just shrug it off and am happy for those who won, remembering one thing: We are all there for Elvis, and we are lucky to be able to do what we do. Q. Would you want to judge an ETA competition? A. No! I have, and it’s very hard. Q. What special care do your Elvis costumes require? A. They need to be washed by hand and hung to dry. I always take good care of them...they are not cheap…lol. They don’t get thrown on a laundry pile…lol. Q. In an article I read, you said, “I know what he (Elvis) wears in his jumpsuits; that’s what I wear underneath.” Please elaborate. ETA Tim E Hendry performing at Port Colborne Canal Days, August, 2017. A. Lol...I’m not telling. Everyone uses what is comfy for them. Q. What are sideburn chasers? A. Lol…I guess they are women who chase after ETAs. But most women are not those…they are true Elvis fans. Q. Is the comradeship between ETAs the same in Canada, the USA, and other countries? Who are your closest ETA friends? A. Yes, it is for sure. I have many good friends: Dwight Icenhower, Jeff Lewis, Pete Storm, Ben Thompson, David Allen, Matt King, Dean Z, Bill Cherry, Mark Anthony, DI Light, Richard Wolfe, James Gibb, Brad Mitchell, Cote Deonath, Cody Slaughter, Matt Cage, Dan Barella, and so on and so on...love them all...all great ETAs. Q. Describe your experiences entertaining as an ETA in Shanghai. A. It was unbelievable! I would love to do it again. Wow! What a place! And the shows were great, sold out. It was a life altering experience. Again, I was so lucky to have been able to do that. Q. Other than Shanghai, have you performed in cities outside North America? Are there international cities where you would like to perform? A. Tons! I have been to St. Kitts, Barbados, the Arctic, and Costa Rica. I would love to perform in Japan and Hawaii. Q. What did you learn about Elvis, his life, and his music from your conversations with Charlie Hodge and the guys in Elvis’s band? A. Charlie told me some very funny stories, for sure…lol. But the biggest thrill was going through the old Elvis-A-Rama Museum in Vegas. He had never been through it before, and I got to go through it with him, pretty much by myself. There were others with us, but Charlie and I were ahead of them. He told me stories about each picture, car, and jacket--everything in the museum. It was very cool to hear it from Charlie. I cherish those memories. What I learned from him and the TCB band was that Elvis was very funny and loved to make sure everyone was happy and laughing. He cared so much about everyone else. Charlie spoke the most about that, and he told me that Elvis was an incredible producer in the studio. He ran the show, for sure; and he was brilliant while recording and dissecting a song. 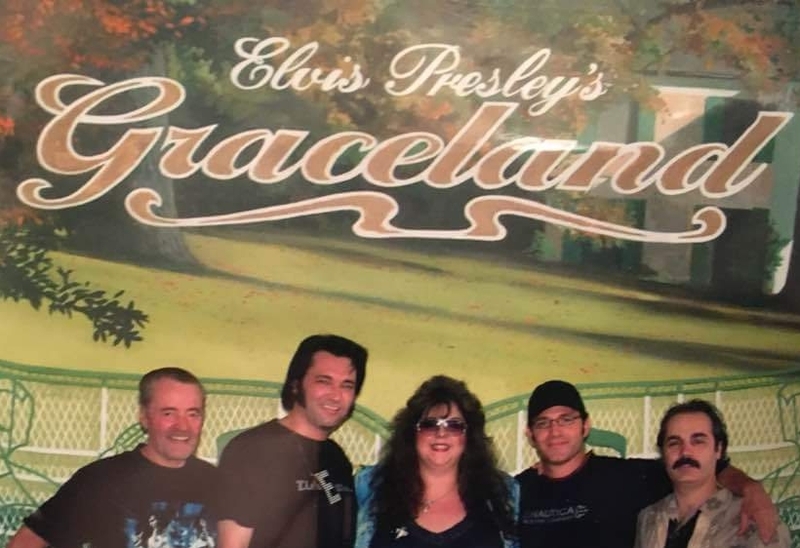 With the band guys, I tried to talk about music...drums, guitars etc., and other stuff other than Elvis, but it always went back to Elvis no matter what. James Burton was especially nice to me, and invited me to walk and talk with him on the way to rehearsal. I got to hang around and watch...it was surreal. Q. Please tell us about the event and circumstances that lead to you receiving Doreen Oldroyd’s generous gift. Q. What advice do you have for young ETAs just starting their careers? A. Work on the voice...most important part...Elvis was an effortless velvet voice singer. You can wear a wig, makeup and suits to make yourself look kind of like Elvis, but if your voice and your singing are weak, then it ruins the illusion and the tribute. Practise singing every day. And love what you do, and always, always, always remember why we all do this...because we love Elvis and his music, and those are his fans we are singing to; and be humble and respect all other ETAs. Q. When you look back on your lengthy ETA career, are there changes you would like to have made? Q. What are the highlights of your career? There are many for me; just being on stage and performing anywhere is a highlight for me. Q. Who are the people you would like to thank for being part of your ETA journey? A. So many to mention: my late father, my mom, my sisters, my band mates--and brothers, Sandra Gold, Larry Fletcher, Barb Mason, Joe Garon, my girlfriend Brandy, Marie White, Roy LeBlanc--for giving me my start, my fellow brother ETAs, all my amazing friends who have supported me through the years--so many of them, and a very special thank you to a close friend who just passed away suddenly on Nov 15th, John D’Acunto from Crown Promotions, who helped me so much in the beginning and was always there for me as a friend trying to help boost my career. I will miss you terribly John. RIP my friend. Q. What are your plans for the near future? What would you like to be doing 10 years from now? 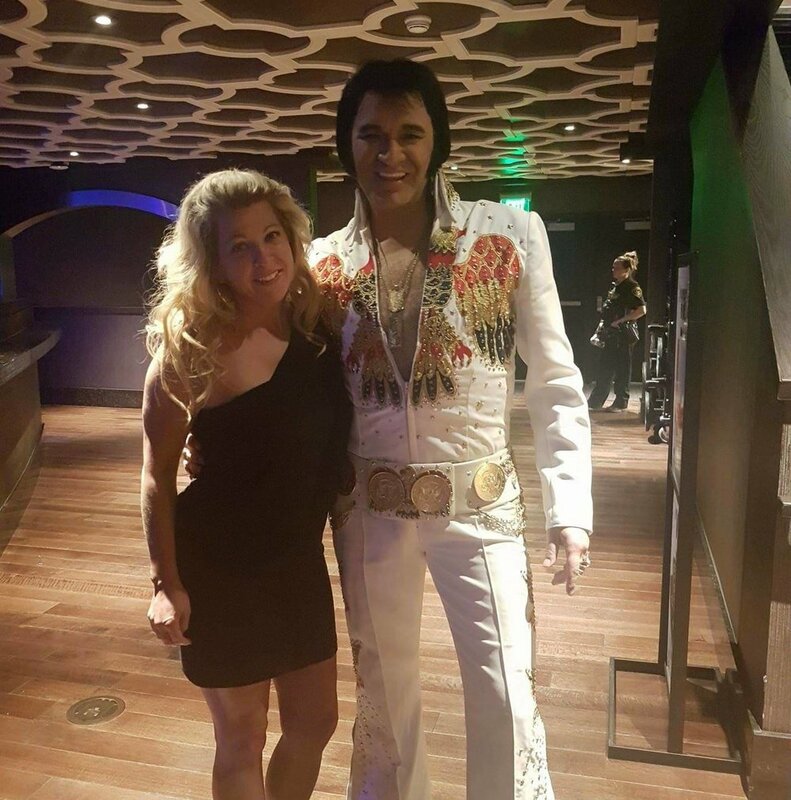 A. I just plan on continuing to do the most sincere, heartfelt tribute to Elvis that I can, and to help keep Elvis’s music alive and well for generations to come. I’m a lucky and blessed man to have all the wonderful people in my life and to be able to do something I love so much. God Bless. 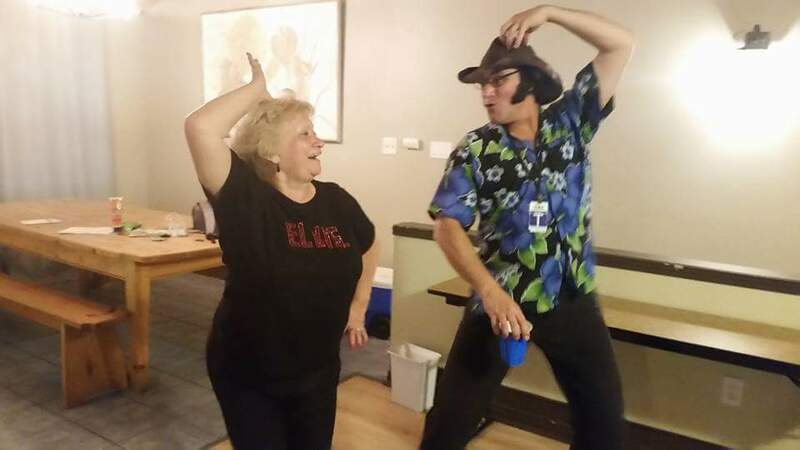 Tim and girlfriend, Brandy at Elvis Explosion, Waterloo, NY. Tim and girlfriend, Brandy, at Myrtle Beach. Family at Collingwood, 2010: Tim with his mom and two sisters. Dad, Tim, Sandra, Kevin Mils, and Oscar Memphis.